As a part of Shared Services backup, we’ll discuss about taking the backup of Shared Services Provisioning information. 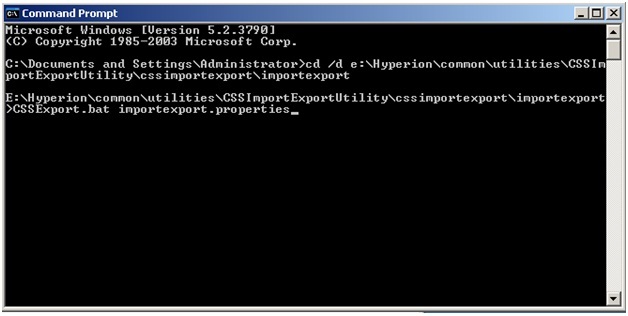 Hyperion Shared Services comes with a utility called CSSImportExport, which helps in taking the backup of all Provisioning information. You need to modify importexport.properties to perform an export or import. I’ll try to explain the areas that are important to perform an export or import. This is the place where you’ll mention the CSS file location. This xml file has the information about external directories. I’ll advice to use the ‘http’ option, because with the arrival of System 11 code line, this information is stored in hit registry and ‘getCSSConfigFile’ will be the most suitable option. The above given option will make sure that all the users and all the groups that start with GR_WA_FR are exported. This is under assumption that importexport.properties and CSSExport.bat are in the same location. Here I’m creating a group called GR_HSS_Train and adding two LDAP users (37817, 32799) to that group. I’m using the same file to Provision the group to have Essbase Server access, Read access to an Essbase application and Explorer access to Workspace. Try to keep the file to be imported (For importing user provisioning information) in the same folder where CSSImport.bat file resides. Change import.maxerrors=0 to import.maxerrors=2000 to avoid any issues with error logging. You can also use this tool to delete users, only modify import.operation=CREATE to import.operation=DELETE. Here your import file should contain the names of users/groups that need to be deleted. Hope this helps you to take user provisioning backups. Next I’ll try to cover how to automate the creation of Users and provisioning using SQL and bat files. Will you be updasting this for 11.1.2.4? Hi Thanks, so the import doesn't work as this was we used to import the users and groups that changed from our active directory account in batch mode. do you see a why to do this in batch mode using lcm or your other tool? If you look at 11.1.2.x code line there is no CSS* utilities. You can either use LCM or API to do it. Thanks, thne I will need to see what your tool can d, can it run in batch? Have you figured out a way to delete users/groups en mass in PBCS? That’s what I thought. I’m beating on Support to address this. Seems like there should be a way when exporting LCM to modify and import back in with a flag. For on-prem we had the importexport.properties file. If they had a flag in the Import.xml within the LCM zip it would seem that would do it. Someone imported 500 groups to my pbcs instance and now we don’t need them. Right now the only way to remove them is one at a time in the GUI!!!! Welcome to the queue Gary. I’ve asked DEV team to give me an option in epmautomate where I can clear security and a command line util to load/delete users. What I heard is we soon might get a (sort of) CSV type of file load for Security than the XML way. Have to test it out to see if it works by selecting ‘Delete’ import option. I think that is going to work for groups only.